Traveler For Good: Passports with Purpose 2012 Starts Today! Passports with Purpose is here! This year travel bloggers are helping to raise $100,000 to build wells in Haiti in partership with Water.org. Access to safe drinking water is one of the most basic keys to good health. Right now, 780 million people, three times the population of the US, lack access to clean water. In a world that can seem so connected and modern, it's sometimes easy to forget that the ability to drink a glass of clean water is not a guarantee. Click here to make your donation. The widget on the right column of this page will show you the progress we're making towards the goal of $100,000! You Can Win a Prize! The 2012 fundraiser with prizes started mere hours ago on November 27 at 11:59pm EST and ends December 11 at 11:59pm EST. During this time, if you donate $10 or more, not only will you feel warm and fuzzy about supporting a good cause, you will also have a chance to win a prize. A great prize. Most likely, a travel related prize. In fact, every person blogging about Passports with Purpose has secured a prize. There's bound to be one that you'd be happy to win. I live in beautiful Denver, Colorado. If you live here, you know it's a great place. If you don't live here, wouldn't you like to visit in 2013? Enjoy the best of downtown Denver with Hyatt Hotels! The Hyatt Regency Denver and the Grand Hyatt Denver each generously donated a one night stay just for Passports with Purpose. Read on to see what you could enjoy if you are the lucky winner. I've stayed at both these hotels and enjoyed their service, restaurants and amenities. These are the hotels I recommend to friends and family when they come to visit or when they want to stay downtown or celebrate a special occasion. These hotels are two blocks away from each other in downtown Denver and the winner will have a chance to stay at both properties. Or, if you're feeling generous, you could give one gift certificate to a loved one for the holidays, and still have one for yourself. Your call. One night weekend night stay at the Hyatt Regency Denver at the Colorado Convention Center including breakfast for two. This Hyatt is right across the street from the Colorado Convention Center and one block away from the 16th Street Mall, within easy access to anything you want to do in downtown. Peaks Lounge on the 27th Floor has an amazing view of both the city skyline and the mountains. 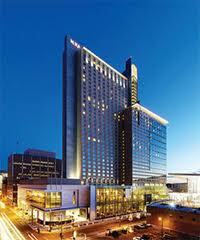 One night weekend night stay at the Grand Hyatt Denver including Grand Club access. The Grand Hyatt just started a $28 million redesign that includes the guest rooms, lobby, and much of the meeting space. The renovation finishes in June 2013, so if you visit in the second half of the year, you'll enjoy a "Grand" new hotel! The Grand also introduced a new restaurant, Pub 17, in July of this year including a lot of locally sourced food and craft beers (this is Colorado, after all, and we're serious about our beer). Whether you give the gift of water or win the gift of a Hyatt stay, thank you in advance for your enthusiastic participation and support of Passports with Purpose! The winner of this prize will receive two gift certificates by mail (they will arrive together in one envelope/package). Each stay must be booked following the directions on the gift certificate. Each certificate is good for a one (1) night weekend stay (includes room rate + tax). Parking and other incidental charges are not included. Certificates are not valid for December 31, 2012. Hyatt Regency Denver Certificate: Good for a weekend night accomodation and breakfast for two. Grand Hyatt Denver Certificate: Good for a weekend night stay for two with Grand Club access. HI! Good to meet a local travel blogger - I live in the Springs. I just wrote a blog post on this and decided to donate for your prize since I live o close! Do you participate in any local travel blogging or writing groups? There is a Meetup for bloggers I keep meaning to go to.